Schedule Honda service, repairs and maintenance at our Honda service center in Fresno, CA. When you visit our Fresno Honda service center, you'll receive top-notch Honda repairs and service from our highly skilled technicians. Our flexible hours make it easy to schedule Honda service and maintenance at a time that's convenient for you. Call the Clawson Honda of Fresno service center or schedule Honda service online, and we'll take a look at your car. Whether you need an oil change, inspection, battery test, brake repair or other service, you'll find the Honda expertise your vehicle deserves at our dealer. We can handle everything from your Honda Accord's first oil change to your Pilot's 100,000-mile service, so don't hesitate to schedule Honda service and repairs at our service center. We can do everything above and so much more. We're open early Monday-Friday and offer extended hours on Saturday to make it easy to bring in your Honda for service around your busy schedule. 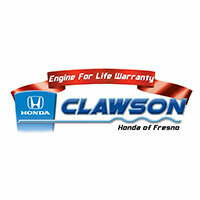 Schedule Honda service at Clawson Honda of Fresno today!